Chaos occurs when the emergence of positive feedback causes coarse synchronization in a negative feedback system. Imagine you are using a camera with a large telephoto lens and you are trying to focus in on a subject in the distance. As you focus, you adjust the lens back and forth, clockwise and anticlockwise. Now imagine the lens does not move smoothly clockwise and anticlockwise, but instead has a limited number of preset positions (say 5 to the left, 1 midway, and 5 to the right). If this were the case, you would find it impossible to truly focus on your subject (unless the focus length just happened to be exactly at one of the 11 preset positions), the best you could do is jump back and forth between the 2 closest positions. Furthermore the degree of focus depends on the size of the step between the 2 closest positions; the larger the step size, the less likely the shot will be in focus. In this focusing set-up, the number of preset positions of course determines the step-size between each individual position; and so obviously the smaller the number of pre-set positions, the coarser the size of each adjustment becomes. In both these systems the step-size between preset positions determines the coarseness of calibration. This concept of degrees of fine or coarse calibration can be applied to the behaviour of all systems, of any type. Imagine if your personality only had 2 modes of expression, super nice or super angry, it’s likely the vast majority of people would think your behaviour a tad unpredictable. The common perception about chaos is that it is all about unpredictability. This unpredictability of chaos is popularly known as “The Butterfly Effect”, a sort of exaggerated version of the domino effect; a small change over here, can cause a large change over there, sometime down the line. The scientific phraseology is that systems which exhibit chaos are “Sensitive Dependent on Initial Conditions” (SDIC). The whole initial conditions thing relates to the classical physics idea that if we know all the forces currently acting on a system then the only remaining thing that we need to know in order to predict the future behaviour of the system, is the exact state of the system as it is right now. If a system is overly sensitive to these “initial conditions” it makes prediction impossible because we need to know these “initial conditions” with an immeasurable degree of exactness. Now imagine we have, or we design, some sort of self-stabilizing or self-balancing system. Such a system would require the ability to find its way to its exact point of balance; this being the point of “true-equilibrium”. Many such self-stabilizing systems exist in nature; most of which self-stabilize in the most obvious way; that is they start off by coarse-tuning and subsequently fine-tune their way to equilibrium. If the system however is unable, or becomes unable, to reduce coarse-tuning to fine-tuning, it will consequently be unable to micro-adjust and hone-in on the single true-equilibrium. When the step-size of the internal adjustments remains too coarse, it causes constant overshooting of the true-equilibrium, which means that the unobtainable equilibrium has now become a point about which the system oscillates… [Think of the classic so-called business cycle of economic growth and recession]. At first glance it might appear that all such oscillations look the same, but actually they come in two different flavours. The emergence of an unobtainable equilibrium means that there are now two different path trajectories that the system can take. The oscillation can be a “tick-tock” oscillation or a “tock-tick” oscillation. So although the system cannot find the true-equilibrium it nevertheless still exists; only now it behaves as a decision point. Depending on which side of this decision point the system evolves to, will determine which path trajectory the system will take. But it doesn’t stop there! The coarseness of the step-size not only determines the ability to self-synchronize to true-equilibrium, it also can determine whether the system is even able to synchronize the two legs of the back and forth oscillation. The path to unpredictable chaos may be a gradual breakdown of synchronicity in behavior – leading to an infinite number of different evolutionary paths – but what emerges from this breakdown however is still an equilibrium of sorts. Each evolutionary path is merely a different version of a previously hidden but now emergent “coarse equilibrium”. 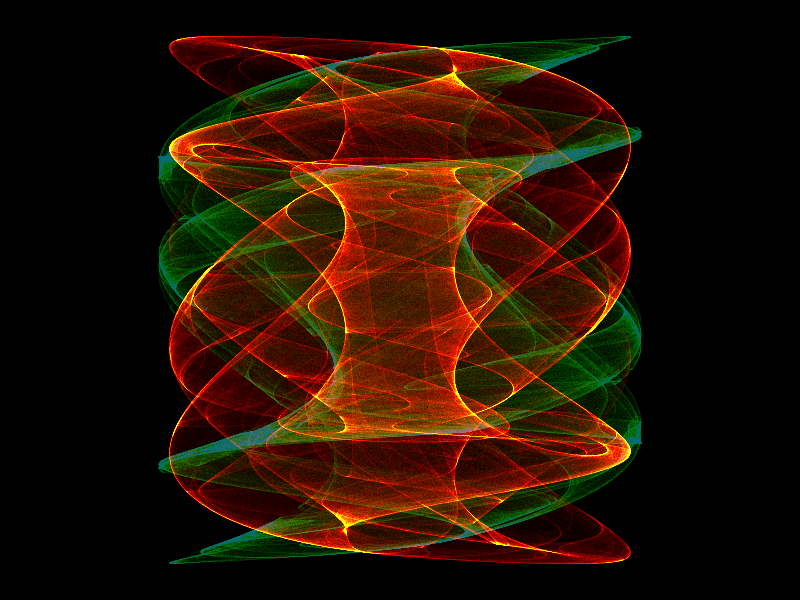 This emergent structure – which results from ever increasing coarse synchronicity – is known in chaos as an “attractor”. In actuality true-equilibrium is itself also an attractor, just not a very interesting attractor. True-equilibrium is a “point attractor” which always pulls the system to the same place, regardless of where it starts from. 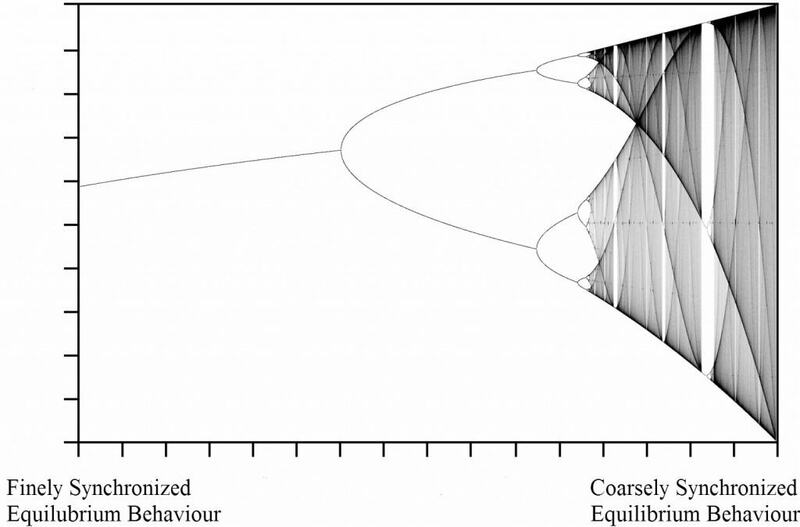 An emergent attractor however has a diversity of evolutionary paths that it is capable of pulling a system to; and the more emergent the attractor the greater the diversity of the evolutionary paths. 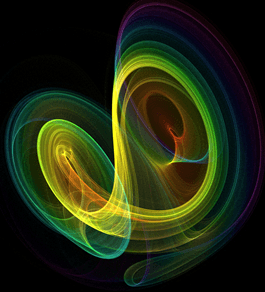 Chaos Theory has revealed within many systems the existence of hidden attractors. 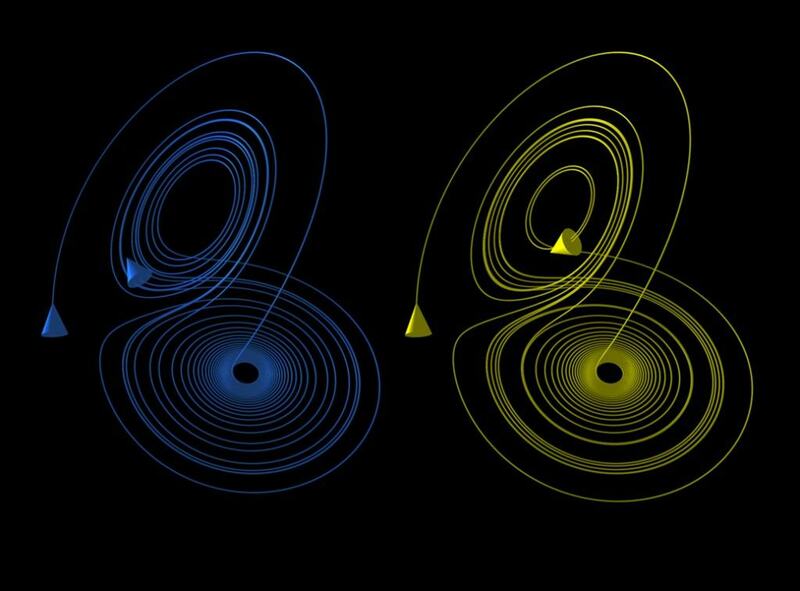 What chaos theory shows us is that attractors act on a system almost like a gravitational force, and the type of attractor is ultimately determined by the degree of coarseness of the system’s internal behaviour. It is as if coarse damping deforms true-equilibrium behaviour in a manner analogous to how excessive stress causes the deformation of elastic materials. It is as if increasing the coarseness of step-size causes the emergence of higher dimensional attractors and the associated diversity of surprising patterns of asymmetric behaviour. Chaos is often described as the “Butterfly Effect” but that idea actually misses the point completely. Chaotic behaviour is in fact behaviour that is almost synchronizing — but not quite. Chaos is a form of coarse stabilization or a form of “Coarse Damping to Equilibrium”. So chaos can be described as “Coarse Synchronicity”, which is the difficulty a self-stabilizing system will experience when trying to synchronize coarsely interacting forces. So why is this important? Well, it is important everything in the universe is both some form of system in itself, and part of a larger system in some form or other; and equilibriums are central to systems. Traditionally equilibrium has been seen only as the single true-equilibrium, however chaos theory shows us that there is more to system equilibrium than a finely-tuned, highly symmetric, but fundamentally bland and featureless uniformity. Chaos Theory shows us that all systems are capable of experiencing a range of equilibrium states, from calm to chaotic, from simple to complex. Chaos appears to be the universe’s search algorithm; a mathematically driven way of non-randomly exploring infinite possibilities, and higher dimensionality.